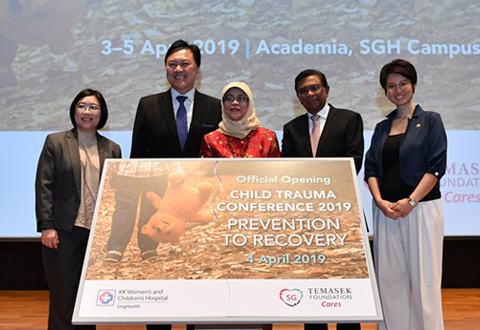 ​The Cleft and Craniofacial Centre is the only dedicated comprehensive service in Singapore for the treatment of head, face and neck abnormalities in children. These conditions could be due to birth defects, accident or injury, or inappropriate growth and development. Optimal treatment of these conditions requires comprehensive, inter-disciplinary treatment planning and management to achieve maximum rehabilitation. Patients also need to be on long-term follow-up as the treatment spans the entire childhood and teenage years. Maintains a coordinator with a 24-hour listed telephone number. We also maintain comprehensive centralised records for each patient, including history, diagnoses, reports of evaluations, treatment plans, treatment, with supporting documentation such as photographs, radiographs, dental models, and audio-taped speech recordings. Organises and coordinates all the allied disciplines involved in the management of the craniofacial patients i.e. physical, occupational and speech therapists; dietitians; medical social workers; and psychiatrists and psychologists. The centre also helps patients and their families understand, coordinate, and implement their treatment plans. Runs monthly Combined Clinics to evaluate patients at scheduled intervals. The frequency and specific content of these evaluations are determined by the condition and needs of the patient and family. Runs a monthly Speech Evaluation Clinic for joint assessment and subsequent management of patients referred for velopharyngeal incompetence. Develops long-term treatment plans for each patient, and modifies them as necessitated by the craniofacial growth and development, treatment outcomes, and therapeutic advances. Weighs all treatment decisions against the expected outcomes and related factors such as facial growth, hearing, speech, dentition, and psychosocial impact on the patient and family. Assists families in securing financial assistance to meet the treatment needs of the patient. Runs a dedicated Antenatal Counselling Program, to promote early identification of craniofacial anomalies among personnel involved in the delivery and neonatal care, including primary care providers in the community. Maintains the Craniofacial Laboratory for long-term clinical and basic research. A specifically designated Speech Room at the centre is fitted with advanced video and audio equipment to assess and treat children with speech problems. A special one-way mirror allows parents and doctors to observe the treatment in an unobtrusive manner. The centre has a vibrant, child-friendly theme and a play area to keep children entertained while waiting for their treatment. We also provide elective and emergency treatment and surgery for hand anomalies, physical defects resulting from trauma and infection, and care of minor degree burns. We have a dedicated team of speech and language therapists at KKH who work with the Cleft and Craniofacial team to provide integrated management for individuals with cleft and craniofacial anomalies. Our specialist speech and language therapists provide routine and comprehensive follow-up from infancy to monitor speech, language and feeding development. Regular therapy is introduced from childhood through to adulthood should any feeding, speech, resonance, and/or language difficulties be detected. In addition, assessment and intervention are also provided to individuals with resonance disorders that do not seem to be related to any structural abnormalities, as well as individuals with genetic syndromes with associated craniofacial malformations. A combined feeding clinic with a speech therapist and a dietitian to provide support for infants and children with craniofacial anomalies and concurrent feeding difficulties. Speech videofluoroscopy (speech x-ray) as well as speech nasendoscopy clinics to further investigate resonance and velopharyngeal dysfunction where necessary for patients with cleft and craniofacial anomalies. Specifically designated speech and language therapy rooms at the Centre are fitted with advanced audio and video equipment to assess and treat the patients under our care. A special one-way mirror allows parents and doctors to observe the treatment in an unobtrusive manner. Certified in Hanen It Takes Two To Talk, PROMPT (USA), Oral motor therapy, VitalStim® Therapy System. Trained in SOS Approach to Feeding, PECS. Other areas of clinical work: paediatric speech and language, adult and paediatric dysphagia, speech nasendoscopy and videofluoroscopy, clinical supervision and clinical research. Internationally credentialed Speech Pathologist for Smile Asia and Operation Smile International. Lecturer, Clinical Mentor, Research and Clinical Supervisor for the MSc (Speech and Language Pathology) Programme at the National University of Singapore. Memberships: Speech And Language Therapy Singapore (Member), Asia Pacific Society of Speech, Language, and Hearing (Executive Council Member), Cleft Lip and Palate Association of Singapore (Member), American Cleft Palate-Craniofacial Association (International Team Member). Certified in Hanen It Takes Two to Talk. Areas of clinical work: Paediatric speech and language. Membership: Speech And Language Therapy Singapore (Member), Cleft Lip and Palate Association of Singapore (Member).